Want to know whether Australian house prices will rise or fall? 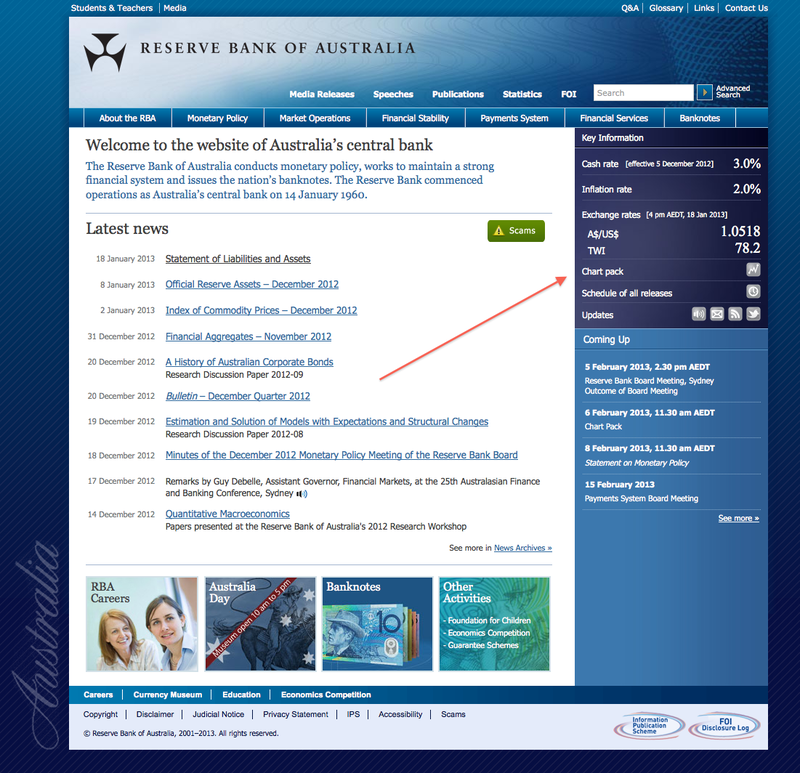 The RBA has the answer. This chart tells us the growth rate in the amount of “credit” and “money” in the economy. As you can see, the growth rate in “credit” has plummeted to less than 5% per annum. In the period where Australian house prices rose the most in history, the annual growth rate in “credit” was three to four times higher than the present rate. Without strong growth in new “credit” issued to borrowers, house prices can not rise much. If at all. Indeed, unless there are enough new buyers – armed with enough newly-issued “credit” – out and about and actively purchasing houses, then house prices must eventually fall. For over twenty years, housing in Australia has been a banker-profit-driven “bubble mania” scheme, you see. To drive up prices, the #1 and absolutely essential ingredient is more and ever more new “credit” – debt – with which bright-eyed and dull-brained buyers – debt slaves – can outbid each other to buy a house. The RBA has another chart that shows this. It will help you to see more clearly exactly why Australian house prices rose so much … until the GFC struck. As you can see, Household Debt (ie, “credit” offered by banks) as a percentage of disposable income rose dramatically for nearly twenty years. It turned down sharply as Australians wisely responded by tightening their belts, and paying down their debts. Then began to climb again – but only a little – thanks to the Rudd government offering “free money” in the form of a doubling of the First Home Owners Grant. This handout of what amounted to a free home loan deposit kept the bubble from collapsing. It encouraged thousands of new buyers – mostly young people with little or no savings – to go to their bank and borrow hundreds of thousands in “credit” to go and bid up the prices of houses again. Unfortunately for them – and the bankers – this could only last for as long as the government was willing, and able, to find more “new home buyers” – new debt slaves – to dangle “free” money in front of. As you can see from the chart, the level of Household Debt to disposable income has now bounced off the ceiling for a second time. Now, it might interest you to know exactly when Australia’s private debt-fuelled, bankster-enriching house price bubble scheme actually hit the ceiling. No, it was not when the GFC struck; when many Australian households began to wake up, and realise that paying down their debts might just be a good idea. Our housing bubble actually hit the ceiling first in early-to-mid 2004. That is when the all-important rate of growth in housing “credit” topped out, and began to fall. As you can see, the rate of growth in “credit” for both “Owner-occupier” and “Investor” housing peaked in Feb-Mar 2004, and has been falling ever since. 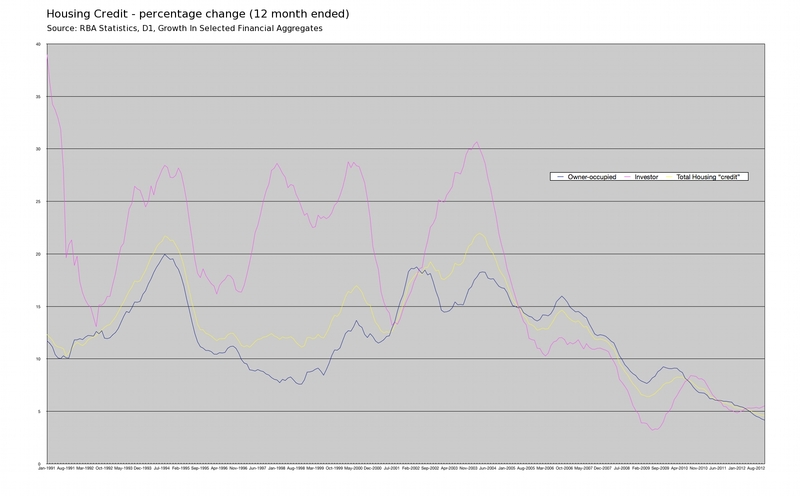 It is particularly interesting to consider the magenta line showing “Investor” housing “credit”. The rate of growth in “credit” for housing “Investors” was, until early 2004, far in excess of that for “Owner-occupiers”, with the notable exception of the early 2000’s global recession that only briefly affected Australia. At that time, “credit” growth for “Investor” housing plummeted to the same level as the “Owner-occupier” rate, before recovering spectacularly to reach a whopping 30.7% annual growth in Feb 2004. What prompted the recovery? John Howard’s introduction of the First Home Owners Grant in 2000, and in particular, his doubling it in early 2001. With a rush of newly-enslaved borrowers bidding up house prices, “investors” too rushed back into the welcoming arms of the bankers, as ever only too eager to lend “credit” at interest to willing borrowers against the “security” of “their” house. Or houses. How many people do you know who (used to) boast about their “investment property portfolio”? From early 2004, the well began to run dry. The rate of growth in “credit” for “Investor” housing began to fall steeply. It fell well below the “Owner-occupier” rate, which was also declining. This overall decline in the growth rate for housing credit has continued ever since. However, thanks to the “stimulus” provided by Kevin Rudd’s further doubling of the First Home Owner’s Grant in 2009 – again, using borrowed money – aided and abetted by the RBA slashing interest rates in response to the GFC, both “Owner-occupier” and “Investor” credit growth bounced briefly. Indeed, “Investor” credit actually overtook “Owner-occupier” credit again for a very short time in 2010, before both continued falling together. Clearly then, house prices in Australia were not driven up over the past 15-20 years by “demand” from “population growth”, from people who needed somewhere to live (Owner-occupiers). On the contrary, by far the strongest rates of growth have – during the bubble phase – been driven by so-called “investors”. Speculators, in other words. People who have come to believe that borrowing money to “invest” in property is a guaranteed path to riches, because house prices “always go up”. Meaning, they believe that if they can only buy now, they can sell later for an easy profit. Sadly, it is not just “investors” who have come to believe this. Most Australian owner-occupiers have come to believe the same thing. It is the very definition of a “bubble mania”, when most people have come to believe they can profit from buying and later selling an “asset”. Who benefits most from a “bubble mania”? Who has the most powerful vested interest in ensuring that the bubble does not burst … that is, not until they are positioned to profit from the “downside” as well? The banks. The same World’s Most Immoral Institution that has been given the power to create “money” – digital book-keeping entries – and lend it to others in the form of “credit”, at interest. And so, dear reader, I suggest that you bookmark this post. In the weeks and months ahead, the powerful banking and property (sales) industry will undoubtedly ramp up the propaganda – and the pressure on government and the RBA to “do more” to support “home buyers”. Meaning, do more to prop up the Ponzi scheme that keeps them all in caviar, Bollinger, and the latest Aston Martin. You will hear all kinds of oh so plausible-sounding reasons and statistics, presented by “experts”, encouraging you to believe that house prices will soon go up, and that now is a good time to buy (meaning, to “borrow”). Whenever this coming bombardment of propaganda causes you to wonder if what they are all saying might just be true; when the charts and statistics and testimonials from credible-sounding people causes you to start feeling “con-fident” about Australian housing, come back and read this post again. 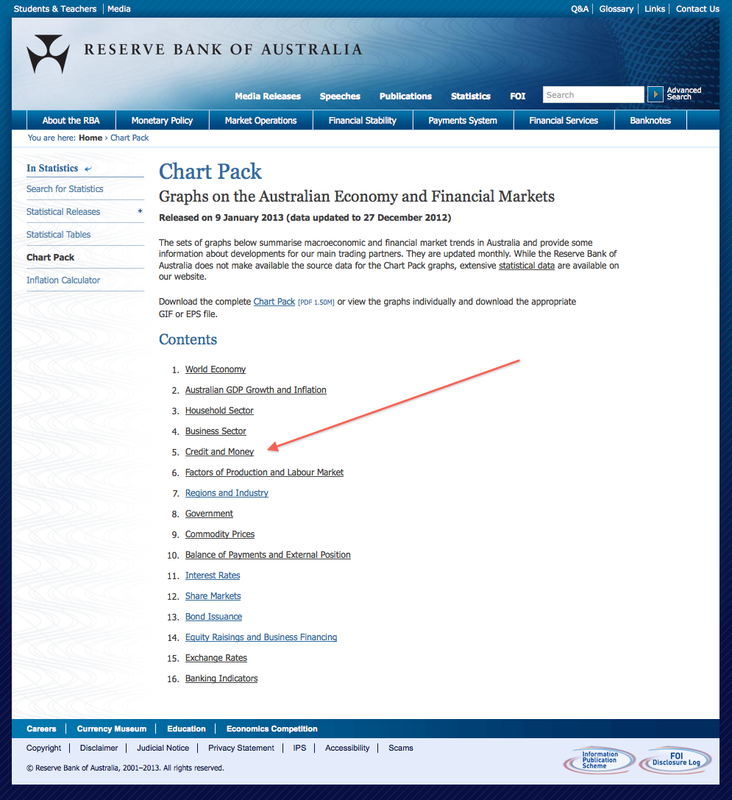 Or visit the RBA’s website, and click on the Chart Pack to see the Credit and Broad Money Growth chart. Because the simple truth is this. Unless the government can find a new source – a BIG source – of new people willing to borrow enough “credit” to keep bidding up house prices, there is only one way for them to go. Unless the government can find a way to reverse the trend of that last Housing Credit chart, then in time, there is only one way that house prices can go. And “up” it is not. Finally, although I am loathe to ever suggest that anyone heed what the RBA Governor says, here is one exception. As you can see, the annual growth rate for Housing “credit” is in a long and steady decline. It is presently less than a quarter of the rate of lending that the bankers achieved at the peak. 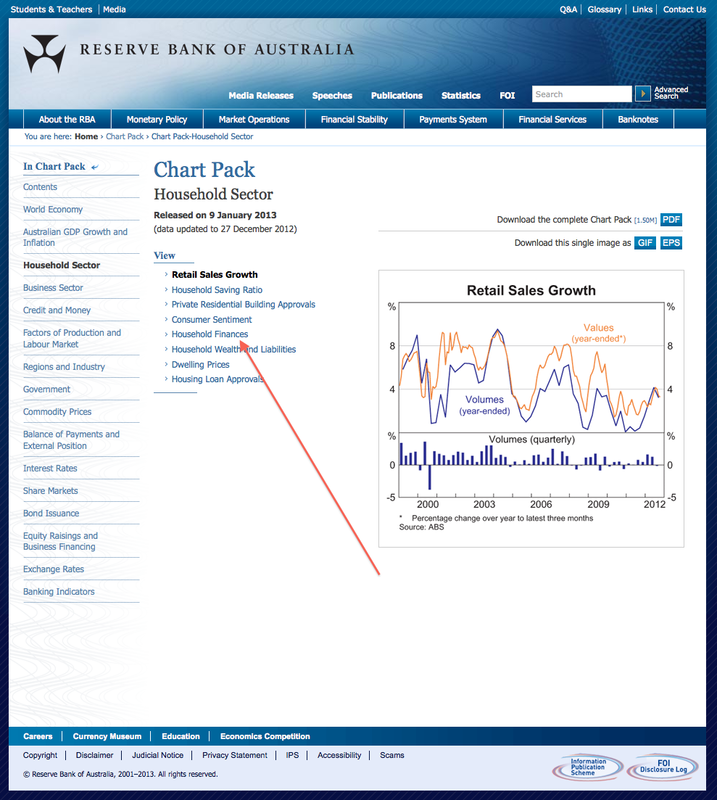 So, The Easy Way To Know Where House Prices Will Go, is to visit the RBA’s Chart Pack and look at that particular chart. If it hasn’t started shooting back up again, to the kind of pre-2004 levels that financed the near twenty-year “boom” period, then you know where house prices will go. If only I could persuade my “buy & hold” wife to exit the housing market..Even without your in-depth analysis & RBA charts, “Blind Freddy” ought to be able to “feel” the Aussie property bubble. But alas, they don’t, and they’ll get creamed, as usual. Friends thinking of buying an “investment unit”..Tried to warn them. Don’t want to hear..Same with the Stock market.. Welcome back. How’s the book coming?? It’s true that the RBA is acting in a ‘prudent’ fashion (from a very low benchmark) but as before, I think it’s safe to expect the mania to spread. It’s not like it needs much to light that fuse. In an ironic twist I can even see the ‘strong’ Australian $ keeping the housing market, i.e the mortgage debt market, ‘robust’ without major support from the RBA. Will Steve Keen have to run up Mount Kosciusko again? I think one important factor to bear in mind is that total housing credit / mortgage debt levels have fallen a lot in the USA; there is presumably, therefore, now some room to convince some folks to take on debt again. Will it be enough? Who knows, but I doubt it. In Oz, while the growth rate in mortgage “credit” has clearly slowed significantly (ie, decelerated) since 2004, it has not actually stopped growing. Indeed, the Rudd doubling of the FHOG bribes briefly managed to get the accelerator down again. Interesting times ahead. Ever played with the RBA’s Inflation Calculator? If only the masses woke up to how much they have been getting shafted. Slowly. For decades. Heard on the radio this morning that government is sitting on some $6 billion worth of student debt that will never be repaid, in other words… junk. I anticipate government bond prices will continue to rise (in AUD), & AUD will continue to ‘strengthen’ against USD. Student debt climbs to record $26 billion … and Labor to chase $6 billion in university debts overseas. The long arm of (an increasingly desperate) Fed Government will find you… wherever you are. Investing in property should be a microeconomic decision. In other words it should make sense in terms of cash-flow. Investing on the basis of pure speculation of rising prices is gambling not investing. If a property provides a steady income then why have an interest in the capital gain, unless you want to borrow against it to buy another income producing asset. Yes, we are run by evil banksters but until our fiat monetary system is dumped there will be money and income from inflation affected assets. I wonder, if the rate of housing credit growth peaked in 2004 but nominal house prices did not peak until a couple of years later, could this be an indication that an increasing portion of the funds for housing in his country are contributed by people outside the Australian banking system? Could it be foreigners borrowing (or perhaps saving) in their foreign countries to buy Australian real estate? Seems like a mugs game with such a high AUD, but could be happening. Is there a way to quantify this? I’ve seen a fair bit of discussion in recent times suggesting the same thing. Not sure how to quantify it and so determine how much truth in it though – will have a rummage about. Probably doing the same here..